The sport of polo’s Spreckels Cup has a deliciously confusing history, a tangle to delight those who take pleasure in unraveling the strands. 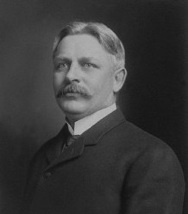 We begin with the namesakes: Shown above, John D. Spreckels (1853-1926) and below, Adolph B. Spreckels (1857-1924), sons of California sugar baron Claus Spreckels (1823-1908). Working together, John and Adolph invested in the Oceanic Steamship Company, J.D. & A.B. Spreckels Securities, the Southern California Water Company, the San Diego and Southeastern Railway Company, the San Diego Union and San Diego Tribune, the First National Bank of San Diego, the Bank of Coronado, Coronado Water Company, the Hotel del Coronado, the Coronado Country Club, and other enterprises. They enjoyed success and were at liberty to indulge their sporting interests. In 1895, John commissioned the first John D. Spreckels Cup, for water polo. Made by Shreve & Co. in San Francisco, the Cup, bearing a water polo scene, was given to the California Swimming and Polo Club as a challenge cup. Perhaps inspired by his sibling, Adolph offered a silver cup at the San Francisco Horse Show of 1895, and in 1896, a silver plate for best performance by an amateur driving a four-in-hand through obstacles. Next, in 1897, Adolph offered a towering silver trophy to the winner of the A.B. Spreckels Cup, a race for thoroughbred 3-year-olds at the Ingleside race track in San Francisco. In March of 1900, Adolph offered a “president’s vase” for best bull terrier at the San Francisco Kennel Club Show, and in April of 1902, he provided a “president’s cup” for the best greyhound, won, interestingly, by a pooch named Rubber Ankles. 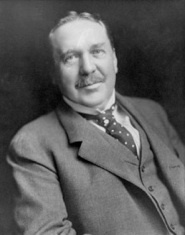 In December of 1902, John put up the cups for an AAU boxing event to be held at the Olympic Athletic Club in San Francisco, and in January of 1906 he awarded the John D. Spreckels Cup for large touring cars to Charles Hawkins and his White steamer after a Los Angeles-to-Coronado endurance run. This trophy could only be awarded if at least two teams from outside of California were competing. It was known as “The All America Trophy,” “The International Challenge Trophy,” “The Pacific Coast All American Trophy” and eventually the “Pacific Coast Open Championship Trophy.” Its present home is at the Santa Barbara Polo Club. On occasion, it has been identified as the Spreckels Cup, but this way madness lies. The trophy is identified with the Spreckels family, but it is not the Spreckels Cup. The Spreckels would keep the silversmiths busy for years to come. In 1910, yachting enthusiasts competed at the San Francisco Yacht Club for three Spreckels Cups, one for each class of boat. In 1930, the A. B. Spreckels Golf Cup was played for at Coronado Country Club. The trophy was sterling silver, made by Reed and Barton. In July of 1935, Dorothy (Spreckels) Dupuy sprang for a trophy named for her late father, A.B. Spreckels. The trophy was for motorboat racing. The first race was held in on the Seine in Paris and the winner was Jean Dupuy, Dorothy’s husband. In the present day, there are two Spreckels Cups in play, both in San Diego. Since 1988, the 1909 John D. Spreckels Cup from Coronado has been played for annually at the San Diego Polo Club. The cup spends most of the year in the art collection of the California Thoroughbred Foundation (CTF), having made its way there from the estate of legendary horseman Carleton F. Burke, whose Midwick polo team was the first to win the cup three times (in 1921, ’24 and ’25). The CTF loans the Spreckels Cup to the club each September, and it’s a beauty. 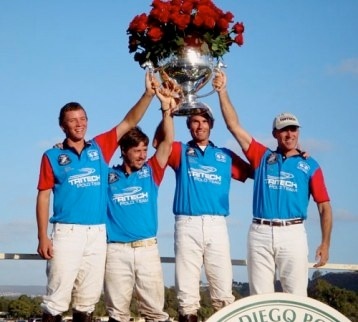 Here, the Tri Tech team holds aloft the Spreckels Cup in October, 2009, at the San Diego Polo Club. Photo by Gina McGalliard. And on the links, golfers at the Coronado Women’s Golf Club compete for a Spreckels Cup each year, keeping the Spreckels name alive in that sport as well. “The finals for the Spreckels challenge cup took place this afternoon between the Riverside B team and the Burlingame team. It was a walkover for the latter, who scored twelve goals to nothing, winning the $500 cup for the third successive time. My virtual thanks to Google, the New York Times, the California Digital Newspaper Collection, and my real thanks to Heather Chronert at the San Diego Polo Club.